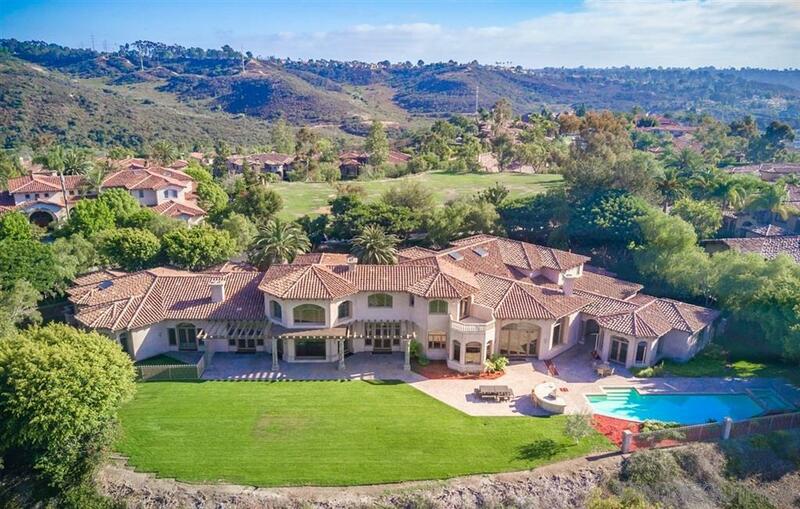 Magnificent estate situated in the private, highly-coveted Rancho Pacifica gated community on a 1+ acre lot. Enjoy spectacular, panoramic views from the moment you walk through the doors & throughout the entire upper level. Ideal, open floor plan w/ master bedroom, wood paneled library, office/theater & fitness/nursery on entry level. All bedrooms feature en-suite bathrooms & large closets. Detached 1 bed/1 bath guest house overlooks the beautiful pool & outdoor patio w/ plenty of space to entertain!, Entry level master bedroom offers spacious his & her master bathrooms & oversized closets. The upper level features a large upstairs play/study area & 3 bedrooms. Gourmet cook's delight with double size kitchens and walk-in wine cellar. Other exclusive features to enjoy include: forever views from the grassy lawns, dog run, elegant driveway & 5 car garage. Ideally located just minutes from Rancho Santa Fe & Del Mar's finest restaurants & shops. This location can't be beat!